I then Googled “flooring” and the name of her town. Susan’s store came up number one at the top of the organic search, but Mr. Storage Container came in number two, right beneath her listing. I pointed out that Mr. Storage Container had five positive reviews on Google, but she had none. That kind of situation is very common. Recently I was meeting via video conference with a dealer from Nevada to assess her online marketing. She too has been in business for over twenty years. When I Googled “flooring” and the name of her town, she and a competitor came up near the top of the search. However, she had only one review, and her competitor had over a dozen. “I see your point,” she said. Get an online system in place! I explained to her that very few people will review a dealership on their own. You’ve got to have a system in place which requests reviews and makes it very easy for your customers to leave one. The dealer that does the best job doing this will win the online reputation game, not the dealer with the best service. In other words, the rules have changed. Just because you have a great offline reputation doesn’t mean it will be automatically reflected online. And since 85% of consumers are beginning their flooring path-to-purchase online, it’s now more critical than ever that you have a plan to generate an ongoing stream of positive reviews. If you have any questions, or if you’d like me to evaluate your online marketing and give you tips on how to improve your online reputation, email me. 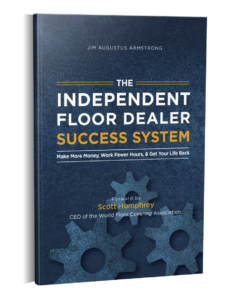 For a FREE copy of Jim’s latest book, “How Floor Dealers Can Beat the Boxes ONLINE,” visit BeatTheBoxesOnline.com.